Testing. And Measuring. And Accountability. One of the things that is brushed over regularly and routinely in dental offices is the metrics. And accountability for those metrics. Metrics can be defined as “parameters or measures of quantitative assessment used for measurement, comparison, or to track performance and production”. Metrics are your vital statistics. And yet so many dental offices have no idea what their numbers, or their metrics are. They don’t know how many new patients they have accepted this week. Or this month, so far. And they certainly do not access to the numbers to compare the New patients seen this year to the number of new patients seen last year. So they just PLUCK a number out of thin air. And we know that number has been plucked because the number they give you is a number ending in zero [in this instance]. The number they provide has totally been made up. It’s usually a contrived combination of BS, hope, and deception. It’s the number they throw back at you for being so bold as to even ask what the number is…. But the defining zero on the end gives the false number away. It’s the same when I ask the dentist for the average new patient value. Those who PLUCK reply with a number that ends in either triple zero or in five hundred. Again, an estimated HOPE at best. [they HOPE I won’t ask any more penetrating metric questions]. A number ending in five zeros [annual productions]. And again, they HOPE that I’m so impressed with the size of the number that I magically disregard the size of the perpetrated PLUCK. There is no hope for these poor souls. Because while ever they BS to me about their magically PLUCKed large rounded numbers, if they are not being internally accountable to themselves and being anally analytic about these vital metrics, then how on Earth can they stand before their employees and ask for accuracy regarding vital metrics that the employees need to be measuring? And so it all falls into a screaming heap…. If you don’t reflect an attention to detail, as the leader, what you will find is that even if you employ a details person, they are soon going to become very very frustrated collecting accurate data for you that you don’t analyse and act upon. And so the tradition will continue…. What gets measured gets improved upon. “What gets measured gets improved upon”. You cannot improve upon that which you do not measure. How can you lose weight if you never ever jump on the scales? How can you run faster if you don’t ever use a stopwatch? How can you ever improve on your dental practice metrics if you do not record the important data accurately? Going through your life guessing and hoping is not the answer. Going through your life guessing and hoping is a recipe for disaster. This is how you end up getting to age 65 and not being able to afford to retire, because you haven’t earned enough and saved enough to be able to afford to retire. Dr Omer Reed told me that 95% of dentists reach age sixty-five and have to keep on working. So David what’s not being measured? I see dental offices that don’t know how many new patients they see on a monthly basis. And they don’t record whether each of those new patients has been referred or whether they’ve come as a result of specific marketing campaigns and media. They don’t have any idea how many of their new patients for the month are seeking treatment because something is broken or painful, or whether they are seeking an examination, that may or may not be overdue. 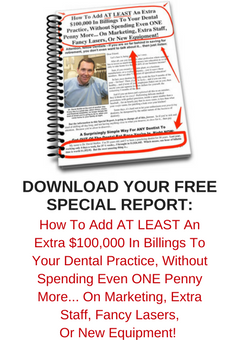 I see dental practices that don’t know how many crowns they seat on an annual basis. They don’t know how many hygiene visits are being performed on a quarterly basis, and they don’t know how many hygiene patients are on quarterly visits or on six-monthly visits. These dentists have no idea how many patients are scheduling appointments when they phone their offices, and what that percentage is. They do not know what percentage of new patient first appointments scheduled are kept, and they have no idea how many of those new patients that do come for their first appointment return for a second appointment or ALL subsequent appointments. “I just need more new patients”. The trouble is, if you’re not measuring and monitoring numbers that easily affect your retention of patients, then adding more new patients into a faulty system is definitely not the answer…. Not measuring, and then HOPING, is not the answer. The Service Is In The Follow Up.